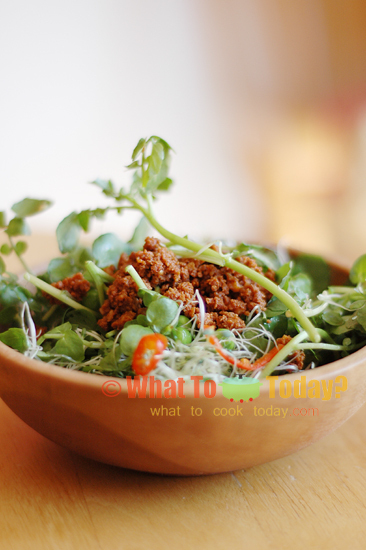 Jamie Oliver’s California Sprout Salad – Learn how to make this nutritious Sprout salad tossed with crispy chorizo and vinegar olive-oil based dressing. Another recipe from Jamie Oliver’s cookbook that does not disappoint. I’m amazed by the choices for food we have these days. Yes, I do agree that the more choices we have, the more “a headache” it causes sometimes. Standing there trying to figure out what’s good and what’s to avoid can be a pain. It’s cool though to see how much more educated we are as consumers these days of what we want to put on or inside our bodies. I like to go to grocery stores or specialty stores just to walk around and see what’s “new” and always walk out learning something. Seller is preaching about nutritional benefits more and more these days. Food is simply not just for filling up that tummy anymore. I think we want more out of our food. This California sprout salad fits into this category. As shared by Jamie Oliver in his Jamie’s America cookbook, In California it’s really common for people to talk about the health benefits and nutritional value of the food they sell. Sprouts have all sorts of things going for them. They are nutrition powerhouse. Packed with vitamins, minerals, and protein. The content of these wonderful nutrition keeps on growing even after you harvest them. Wow…can we ask for more? Then the watercress or Arugula, whichever you use are also packed with good stuff!!! 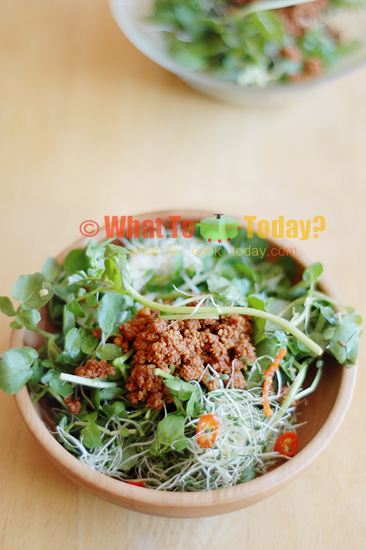 The dressing of this salad is one of the highlights of the sprout salad. Made from chorizo that you crisp up, really taste heavenly together with the salad. And you know what? If you have tortilla or flatbread, you can use this sprout salad as the filling. Perfect! 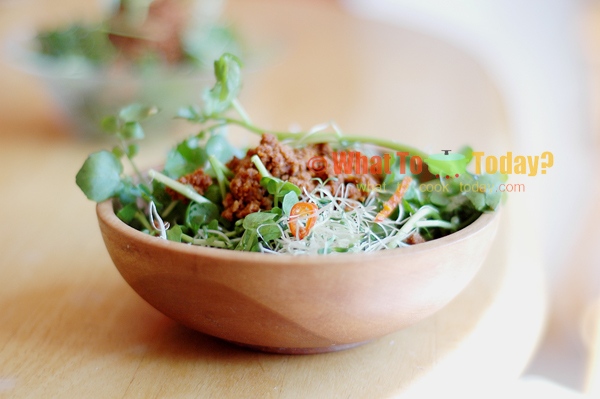 Learn how to make this nutritious sprout salad tossed with crispy chorizo and vinegar olive-oil based dressing. Another recipe from Jamie Oliver's cookbook that does not disappoint. I suggest to dress the salad only when you are ready to serve them. Toss all the salad ingredient together in a big bowl, then transfer it to a nice serving platter and serve the dressing on the side so people can drizzle their own dressing.